As anyone in this industry knows, filming can be a complex business, with obstacles and hurdles to overcome even for the shortest project. 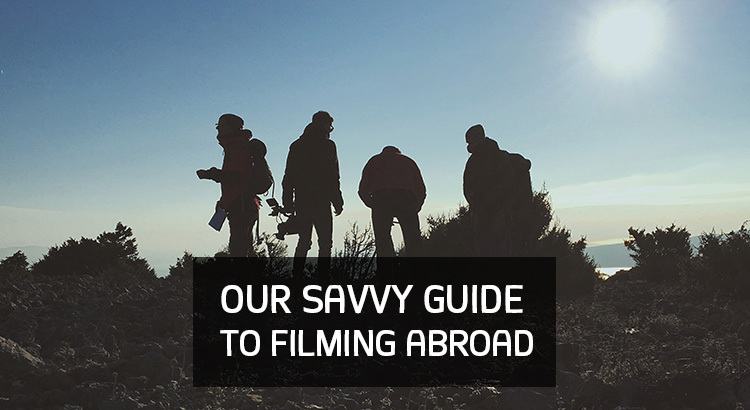 Filming abroad can present very specific challenges as well as rewards, with plenty of research to be done ahead of time. When done correctly however, venturing beyond your borders can be a once in-a-lifetime event. So how do you ensure a drama-free shoot in a foreign country? We have put together a list of tips, tricks and advice to make your shoot abroad a complete and total success. When arranging crews, permits, visas, travel, hotels and other services, book as far in advance as possible. Booking ahead of time will ensure that you get the best rates and save a lot of money. Also, don’t forget the time difference. If you’re reading this during the daytime in the United States, it is already evening in Europe. And in Asia, it’s already tomorrow. So, if you happen to be organising a shoot in either of these regions, and you’re based in Berlin, you’re already a day behind. Some countries require visas to be obtained in advance. This process can take anything from one week to one month to complete. Visit VisaHQ for country specific information. Another vital point to remember before you travel is that voltage and power outlets vary around the world. You should have the right plug adapters and power converters before setting off. Most plug adapters do not convert the power. Laptops and video cameras usually have built-in converters, but you will need to buy a separate power converter for all other devices. If your voltages don’t match you could end up blowing a fuse. You can find a list of electrical systems around the world here. By working with local film crews in the country or region you are shooting in, you end up killing two birds with one stone. First of all, you reduce or eliminate travel expenses considerably, and save on having to ship in large amounts of equipment. This can often incur customs fees, not to mention the hefty extra baggage charges at check-in. Local crew = local knowledge. Secondly, and most importantly, you will be working with people who know the local terrain, language, and customs. This kind of local knowledge is the single most effective way of reducing potential problems, because your locally based team will know how to avoid country-specific risks. Imagine your reaction if your production had to be shut down because you did not get the right permit, or decided to shoot on a major local holiday when everything was closed? What would happen if you chose to shoot on a forbidden location, or didn’t follow the specific local shooting code? You can spend quite a lot of time researching the filming laws in your destination country, checking with the local film commissions and other government organizations. Alternatively, hire a local fixer, scout or production assistant who knows the right people and permits, and who can take care of everything prior to your arrival, thus saving you valuable time. Don’t forget what a gift it is to travel and to have the opportunity to discover new places and people. If possible, schedule some time to get out there and explore a little. Your local crew will probably have some great advice on places to visit in the area. Enjoy yourself; you won’t regret it. Need help planning your next film production project? Let us help! At the Global Media Desk we specialize in bringing your visions to life. We only work with the top regional professionals in such varied fields as video production, photography, and film & video crews. Please  contact us with any questions you may have about shooting in Canada or any country around the world. You can also request a free online quote to see how we can make your project a complete success. This post was originally published in August 2014. Updated in April 2018.